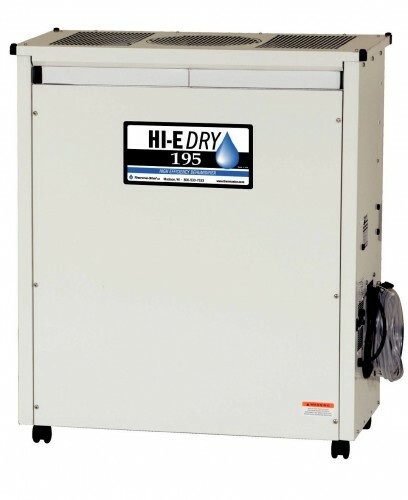 Hi-E DRY 195 dehumidifiers are designed and built with emphasis on efficiency and durability. Today’s Hi-E DRY 195 dehumidifiers remove up to seven pints of water per kilowatt hour, while the industry average remains at only two to three pints. The high-efficiency design of Hi-E DRY 195 dehumidifiers offer more than just dramatically reduced utility costs. The larger water removal capacity from a smaller, more efficient refrigeration system eliminates the need for 220 volt circuits in many applications. 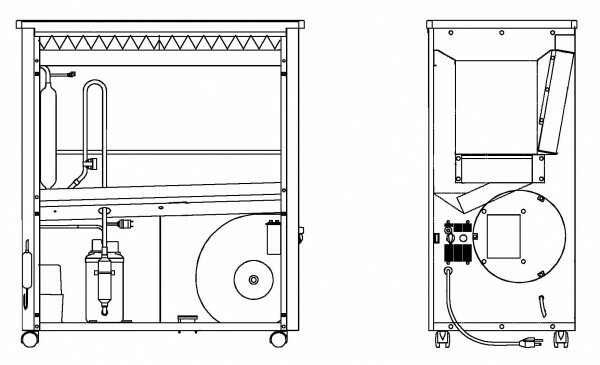 The smaller refrigeration system allows Hi-E DRY 195 dehumidifiers to cost less than other commercial dehumidifiers of equal capacity. The Hi-E DRY 195 high efficiency dehumidifier utilizes refrigeration to cool the incoming air stream below its dew point as it passes through the dehumidification (evaporator) coil. This cooling results in the removal of moisture (latent heat) and reduction in temperature (sensible heat). The cooled and dried air is used to precool the incoming air stream resulting in up to a 200 percent increase in overall efficiency. After the precooling stage the processed air is reheated by passing through the condenser coil. The latent heat removed by the evaporator coil is returned to the air stream at this stage as sensible heat, resulting in an overall temperature increase from the incoming air. Performance Hi-E DRY 195 dehumidifiers are designed and built with emphasis on efficiency and durability. Today’s Hi-E DRY 195 dehumidifiers remove up to seven pints of water per kilowatt hour, while the industry average remains at only two to three pints. The high-efficiency design of Hi-E DRY 195 dehumidifiers offer more than just dramatically reduced utility costs. The larger water removal capacity from a smaller, more efficient refrigeration system eliminates the need for 220 volt circuits in many applications. The smaller refrigeration system allows Hi-E DRY 195 dehumidifiers to cost less than other commercial dehumidifiers of equal capacity.